Simon Townshend is Pete Townshend's younger brother, born October 10, 1960. Simon, has been involved on and off with The Who for most of his life, beginning with the "Newsboy" on the 1975 "Tommy" Soundtrack. More recently, Simon was on the "Daltrey Sings Townshend" tour in 1994 and stood in for Pete at the September, 1995 Who Convention. 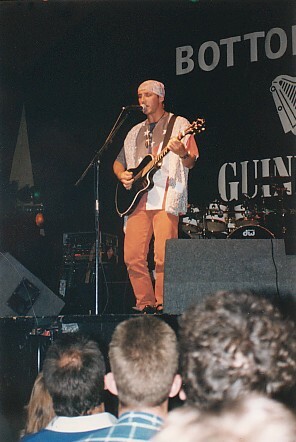 Simon was also the opening act at the Convention (pictured). Simon joined the Who "Quadrophenia" tours of 1996 & 1997, playing various guitars and singing lead vocals on, "The Dirty Jobs". He joined the 2002 & 2004 Who tours, to add another guitar to Pete's in order to expand the set lists and create a more exciting show. Simon is a gifted songwriter/performer in his own right. He released is first single, "When I'm A Man" at the age of 13 !!! More recently, he has been releasing phenomenal music via his website (link below). I discovered Simon back in 1983, with his album debut of, "Sweet Sound", which was produced by Pete. It wasn't until the 1995 Who Convention, that I saw Simon perform live. He was absolutely amazing! Tremendous energy and talent unleashed like nothing I've never seen before. At that moment, I became a "Simon Fan" and made every effort to see all of his shows. Each show was better than the one before it -- powerful and exciting. The next time Simon is in your area - GO SEE HIM !!! In 1996, I was given a copy of Simon's <then> new album, "Among Us", from Simon's other talented, older brother (and co-manager), Paul. I played that CD almost every day for a year! If you are unfamiliar with Simon's music and want to start somewhere, I highly recommend starting there - you won't be disappointed - it's a great album !! !